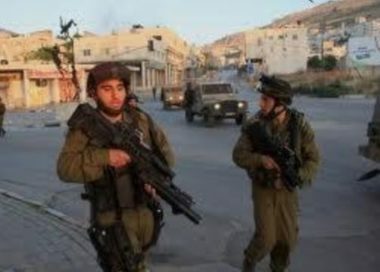 Israeli soldiers attacked, Friday, the weekly procession in Kufur Qaddoum village, east of the northern West Bank city of Qalqilia, shot two Palestinians and caused many to suffer the effects of teargas inhalation. 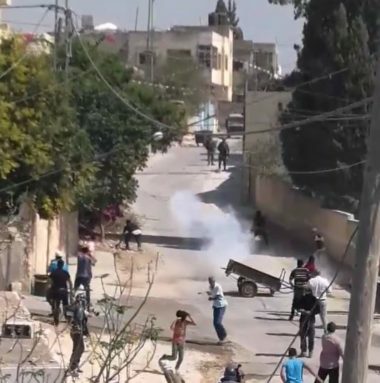 Morad Eshteiwi, the media coordinator of the Popular Resistance Committee in Kufur Qaddoum, said the soldiers resorted to the excessive use of force immediately after the procession started from the center of Kufur Qaddoum. He added that the army invaded the village while firing live rounds, rubber-coated steel bullets, gas bombs and concussion grenades, shooting two Palestinians with rubber-coated steel bullets, and causing many to suffer the effects of teargas inhalation. Several youngsters then started throwing stones and empty bullets at the invading army jeeps, while the army fired more live rounds, coated steel bullets, gas bombs and concussion grenades. Kufur Qaddoum holds ongoing weekly processions against the illegal Annexation Wall and Colonies, and demanding the army to reopen the town’s main road, which was blockaded fifteen years ago, to enable easy access for colonialist settlers driving to and from Kedumim illegal colony, which was built on private Palestinian lands. 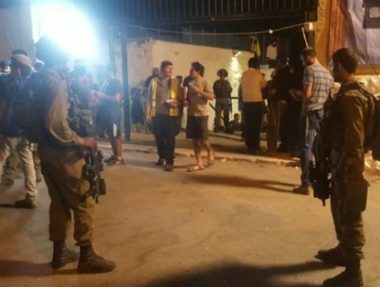 Also on Friday, the soldiers attacked the weekly nonviolent procession against the Annexation Wall and Colonies, in Bil’in village, west of the central West Bank city of Ramallah, wounding one Palestinian.